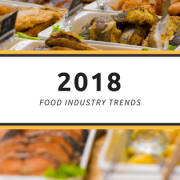 Every year, analysts from various markets put together lists upon lists of what is new in food and beverage for the upcoming year. We’ve taken a cue from them to make a master list of the bigger trends and predictions that will shape consumer behavior. Buzzword bingo over here. Mindfulness has officially reached mantra status, which probably means that too many people are talking about it. When it comes to food, mindfulness is not quite the Zen experience you were thinking it would be, but more so “the quality or state of being conscious or aware.” Driven mostly by Millennial buyers, this consumer attitude is meant to truly understand everything possible about a brand, from ingredients to sale, as Millennials are most apt to purchase based on brand value alignment. We’ve officially moved on from “farm-to-table” into a more ethical awareness around food waste and packaging waste with a demand from consumers to understand exactly how it is that companies are using their resources. This has lead to more packaging containing words like “biodegradable” or “upcycling” to communicate the dedication of a company to sustainability efforts. Maybe it’s the Whole30 impact on marketing, or maybe people really understand “from scratch” initiatives or a slower food movement, but processing technologies are increasingly being used for marketing purposes. Claims, such as “cold-brewed” or “sprouted,” are appearing on labels to promote the products’ health benefits. We chatted earlier in the blog about the anti-GMO movement in regard to sugar, and this is a direct result of that knowledge or crowdsourced concern for understanding how food is handled on a larger scale. It all starts with the field where our food comes from. With the world’s population still growing, and over 65% of us living in urban areas, our limited resources like soil, water, and land are all in a vulnerable state. Much like we mentioned in the positively processed and full circle initiatives points, the movement for a more direct model of farm-to-consumer as it relates to nature has been increasing. As younger farmers move into the field, and technology plays more of a role in everything from planting to harvesting, we are entering a new era of agriculture which will impact everything. Fortunately, this is not about political parties. Food policy is a bipartisan issue with rules and regulations being built and dismantled as trends emerge and new normals are established. With conversations swirling around things like climate control, immigration, importing/exporting, farming, and the environment, food politics will be a topic that is continually at the forefront of our economy. We’re committed to assisting you with your wholesale ingredient needs, no matter the shifts in consumer demands. Contact us today for a quote for your business as it adapts to the changing market. Food-manufacturing and food-processing companies are pushing to rid their products of genetically modified organisms due to increased demand from customers. As consumers seek healthier lifestyles and diets focused on natural ingredients, companies have had to adapt to keep their sales up. For example, The Hershey Company announced in early 2015 they would be removing GMO ingredients from almost all its products. Most notably, Hershey’s Kisses and Hershey’s Milk Chocolate Bars are no longer made with genetically modified beet sugar. Rather, they are being made with cane sugar. Hershey’s isn’t the only company ridding their products of GMOs, but they are the most notable. While they haven’t yet committed to shedding GMOs from all their products, that point appears to be coming. Consumers are demanding it, and consumers usually win. Where Can U.S. Producers Source Non-GMO Sugar? Currently, most of the sugar grown in the United States is beet sugar, which can be genetically modified. In order to acquire non-GMO sugars, companies need to source internationally, with Brazil becoming a more and more enticing market. Brazil is the largest cane-sugar producer in the world, although a lot of their natural cane sugar goes to create sugarcane ethanol (fuel), so they aren’t necessarily the largest producer of edible cane sugar. That could change, however, as more and more companies in the United States and elsewhere look to Brazil for the pure, non-GMO cane sugar. Brazil has the perfect climate for cane sugar, which used to be the only type of sugar anyone wanted. Will their high level of production increase as more U.S. producers seek natural ingredients? Or, will the beet-sugar producers in the United States start to remove their GMO crops and produce natural beet sugars? The costs are generally higher with non-GMO ingredients, which means the price of cane sugar could climb significantly if companies look to source their cane sugars from Brazil and other foreign countries. Of course, there are costs to beet-sugar producers switching their business models as well. With consumers demanding more natural ingredients, will they also bear the brunt of these price increases? In general, natural ingredients cost more, so it will be very interesting to follow these trends to see how the sugar industry handles these consumer demands. We are committed to assisting you with your needs no matter the shifts in consumer demands. At Bremer, we carry both GMO beet sugar, and Non-GMO can sugar. Let us know what your consumers are demanding and how we can help.